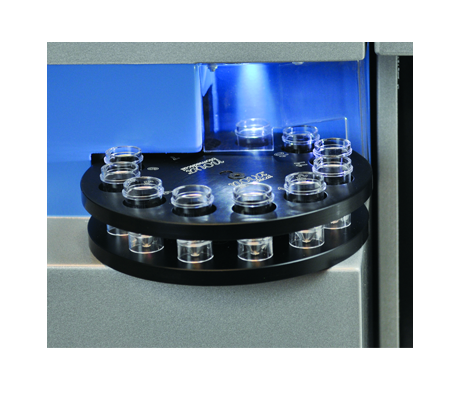 A fully-automated, 12-position sample tray allows walk-away sample analyses. Samples can be continuously added to the tray, allowing continuous workflow. BioProfile CDV’s touchscreen interface includes time-saving features like an autocomplete function for faster same ID, batch ID, vessel ID, and cell type entry. 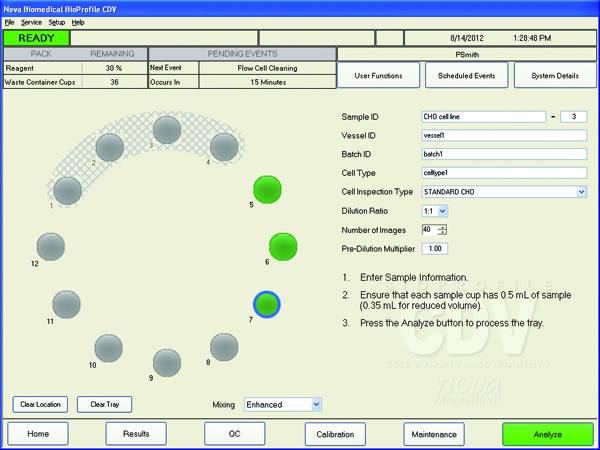 Operation is as simple as entering sample information, loading sample cups, and touching" Analyze". 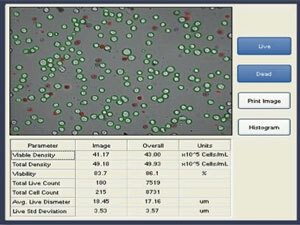 Results are displayed for each sample as soon as testing is complete. A high resolution vision system provides precise auto-focusing on a mono-layer of cells within the counting chamber and captures high-quality cell images. 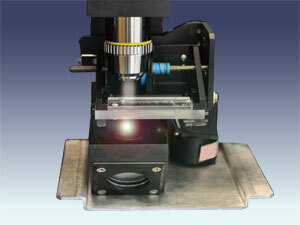 Images from up to 40 optical fields are captured in seconds. Advanced algorithms rapidly process images from up to 40 optical fields, allowing thousands of cells to be counted for more accurate, reproducible cell counts. BioProfile CDV reduces operating cost by consuming minimal reagent volumes. Easy-to-use reagent cartridges analyze over 300 samples per cartridge and can be replaced in minutes. 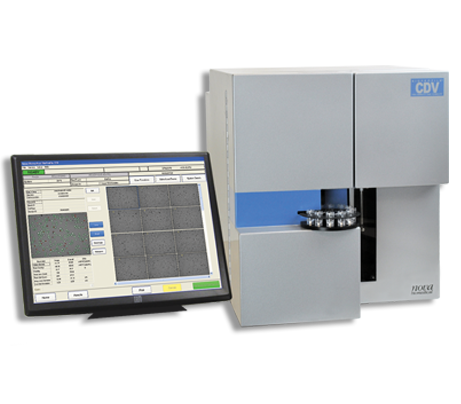 With a high-resolution measurement range of up to 80 million cells per milliliter and a cell count analysis time of less than 3 minutes, BioProfile CDV is the ideal productivity tool for biopharmaceutical cell culturing, production, and cell-based research. To request BioProfile CDV literature and specifications, click here. BioProfile is a chemistry/cell viability modular instrument that measures up to 15 key cell culture attributes. By combining as many as five separate instruments into one easy-to-use instrument, BioProfile FLEX simplifies workflow and saves time, labor, and operating cost versus multiple instruments. Control levels of waste product. The modular design of BioProfile FLEX can be customized with one to four analytical modules to consolidate up to 15 vital cell culture tests. Saves as much as 30 minutes per sample compared to using multiple instruments; analysis as fast as 2 minutes per sample. Simplifies data collection, analysis, archiving, and regulatory compliance. Conserves cell culture mass and end product. Saves up to 15-20 square feet of valuable bench space and saves hours of maintenance each month compared to multiple instruments. into the BioProfile FLEX analyzer is user programmable. Individual syringe or cup samples can also be analyzed during periods when on-line autosampling is not scheduled. The BioProfile FLEX Sample Retain Collection System is an accessory used to automatically collect and store bioreator samples in a refrigerated environment for further analysis. The addition of the Sample Retain Collection System allows user-selectable retained sample volumes from 1.0 to 50 mL and selectable storage temperature down to 3˚C. 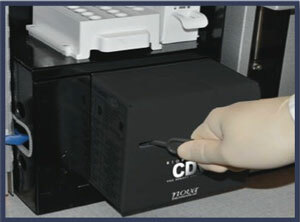 Sampling and storage can be initiated manually or on an automated schedule. The Nova OPC Connectivity Suite integrates BioProfile FLEX with any OPC compliant devices such as bioreactor controllers, data historians, laboratory information management systems (LIMS), and plant management systems. Certifications & Compliance: ISO 13485:2003 Quality System Registration, IVDD, Meets IEC 61010, UL, CSA Standards FDA Labeling: For in-vitro diagnostic use.